At the end of the Carboniferous and beginning of the Permian periods the Mendip region was transformed from a humid, tropical coal swamp into a bare, craggy upland surrounded by desert. Britain was part of a huge landmass, cut by a vast mountain chain, stretching for thousands of kilometres to the east and west. The Mendips formed part of this mountain range, and at this time were much more imposing, perhaps climbing to more than 1500 m.
In the UK, the characteristic sediments of the Permian and Triassic are red sandstone and mudstone, and very coarse-grained rocks containing angular or rounded rock fragments called breccias (predominantly angular fragments) or conglomerates (predominantly rounded fragments), that share many features with rocks formed in modern deserts. In modern deserts, debris from upland regions is channelled to surrounding lowlands through steep sided gullies called wadis. Occasional heavy rain produces flash floods that move boulders and scree to lower levels, eventually disgorging sediment at the mountain front to form a broad apron of debris. Evidence of similar processes is seen in the Triassic rocks of the Mendips, known as the Dolomitic Conglomerate and Mercia Mudstone and shows that this upland region was quickly being eroded. Towards the end of the Triassic, there is increasing evidence that the sea was beginning to encroach on the Mendip area. Evidence for this is provided by the youngest part of the Mercia Mudstone, named the Blue Anchor Formation, which are greenish-grey rocks rather than red, and contain tiny marine fossils. These rocks occur north and south of the Mendips, but thin rapidly as the Mendips are approached. 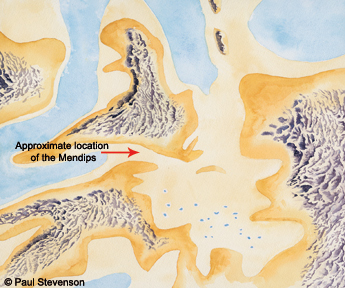 In the latest Triassic the sea finally transformed the Mendips into islands, inundating large areas of the region and depositing a thin succession of dark, organic-rich mudstones, fine-grained limestones and conglomerates, named the Penarth Group. Deep fractures opened up in the rocks forming the exposed parts of the Mendip islands, and into these were swept the bones of late Triassic lizards, gliding reptiles and dinosaurs. Thus, by the close of the Triassic, the Mendips had been transformed into an archipelago, lapped by a shallow sub-tropical sea.